At Eurotech Auto Service in New Brighton and Woodbury, MN, we offer more than just your average auto repair. Our Mercedes repairs are top quality, honest, and completely transparent. Along with our professional repairs, we offer unmatched customer service and a friendly, no-stress environment. Our Mercedes repair shops equip the newest technology and tools to handle your vehicle with the care that it deserves. Our mechanics are ASE certified and are extremely passionate about what they do! Mercedes vehicles are sophisticated and complex, which requires a shop with special tools, knowledge, and training to repair and service. Our shops have the Xentry Das scan tool for vehicle programming and are able to access factory wiring diagrams for those trickier issues that might not be the easiest to diagnose. We offer a full range of services, including both major repairs and regular maintenance. We can assist you in taking care of the many factory maintenance services, Flex A or B service as well as additional services C-H, that your vehicle may need as well and only using the highest quality of parts. We also offer a 3 year or 36,000-mile warranty on parts and labor at our shops - the best in the industry! At our Mercedes auto repair shops in New Brighton and Woodbury, we have the latest diagnostic scan tools and high-quality equipment to properly care for your vehicle. Along with our amazing warranty, we also offer a free local shuttle service, a comfortable waiting area, a play area for kids, free wifi in our customer lounge, and loaner vehicles available when needed. 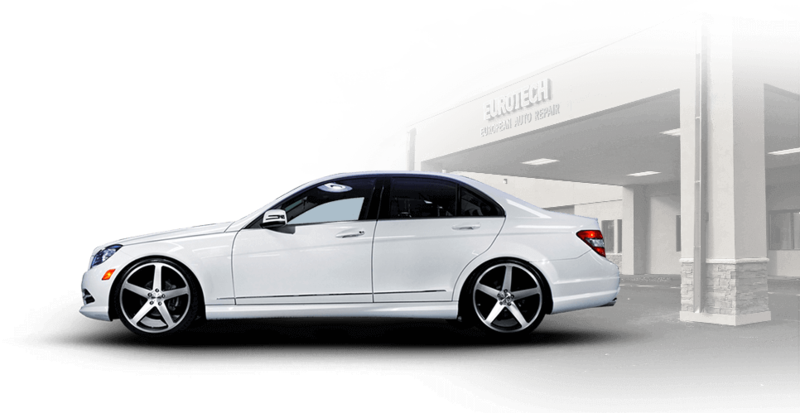 If your Mercedes needs a repair or service in New Brighton or Woodbury, MN, stop by the experts here at Eurotech Auto Service or give us a call today!